...THREAT FOR ACTIVE SEVERE WEATHER WITH POTENTIAL FOR A FEW SIGNIFICANT TORNADOES...VERY LARGE AND DESTRUCTIVE HAIL...AND DAMAGING WINDS BECOMING MORE PROBABLE ACROSS NORTH CENTRAL TO NORTHEAST TX INTO THIS EVENING... STRONG MID LEVEL SHORT WAVE TROUGH LOCATED OVER ERN HALF OF NM IS PROGGED TO MOVE ENEWD THIS FORECAST PERIOD ACROSS THE SRN PLAINS AND SHOULD REACH THE OZARKS/LOWER MO VALLEY BY 12Z SATURDAY...WITH LONG WAVE TROUGH EDGING EWD INTO THE SRN PLAINS. ASCENT AHEAD OF THESE FEATURES AND ATOP MODIFYING AIR MASS WILL SUPPORT AN ACTIVE SEVERE WEATHER EVENT ACROSS PARTS OF N TX TO NRN LA THROUGH TONIGHT...WITH A RISK OF A FEW STRONG TO SIGNIFICANT TORNADOES... VERY LARGE HAIL AND DAMAGING WINDS. 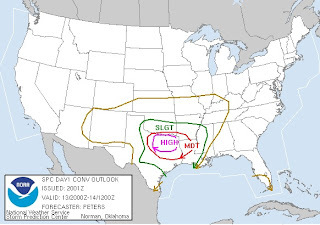 THUS...A HIGH RISK HAS BEEN ADDED TO THE CONVECTIVE OUTLOOK ACROSS PARTS OF NORTH CENTRAL TO NE TX.